Where does the tiger sleep tonight? For some it’s the ‘mighty jungle’ but this one spends his nights snuggled up with 17-year-old Felicia Frisco. Felicia has been sharing her bed with Will the Bengal tiger since the day he was born and the pair will remain bedfellows until he’s a year old. “I get a lot of hair up my nose and all over my sheets,”said Felicia, from Tampa, Florida, who has been caring for Will since the day he was born. “He likes to lick me a lot too,”she added. Will, who is now six-months-old, was bred in captivity by Felicia’s parents who run an educational project called Tiger Encounter. This entry was posted in Animals & Pets, Featured and tagged bed, Bengal tiger, Felicia Frisco, Florida, Girl, sleeps, Tampa, with. Bookmark the permalink. Here is the true story about Will the tiger. Will gets slowly paralyzed. Will suffers. He can`jump on the bed anymore. He has to be lifted and those ignorant circus people won`t let him go home. Honestly Im not a AR nut but this is so wrong on so many levels. Poor Will. The LION sleeps tonight, you massive tool. 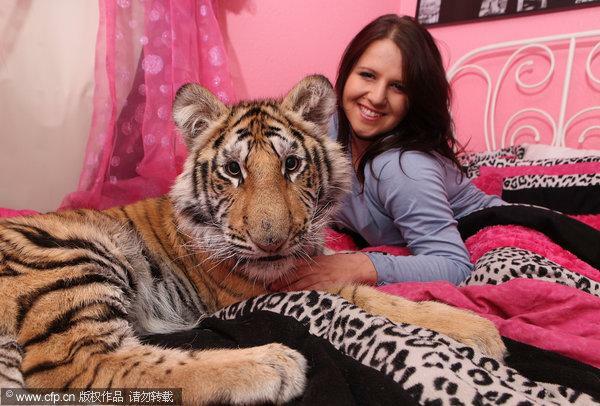 He’s a real tiger in bed!! !